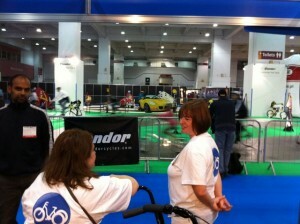 By the time I had a decent mental map of what was where at the Cycle Show it was all over. 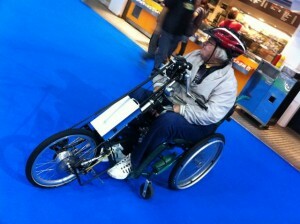 Even using one of Barry’s handcycles to explore the stands at Earls Court, it took three days before I could unerringly find my way back to an interesting item. 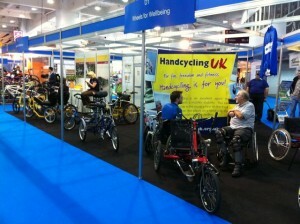 Not that I had too much time for browsing, I was there to help out on the Inclusive Cycling stand after all. 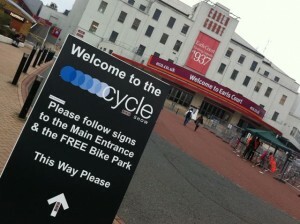 Getting back to our stand was far easier though, ‘Inclusive Cycling’ was clearly sign-posted along with all the other major exhibits at the show; it’s now entered the mainstream in the cycling world along with BMX and MTBs. Positioned between the Commuter Test Track, the Kids Test Track and a coffee bar we were in a great location,although it did get a little noisy every now and then. This was wholly due to the enthusiastic encouragement being given to people taking the Handcycle Challenge – a 200m sprint against the clock. 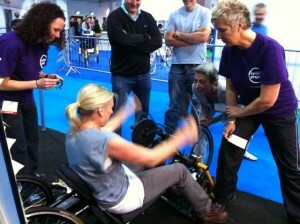 Popular with all ages – even a couple of handcycling pros visited the stand to show how it was done – most would hit ‘the wall’ with some way to go to the finish line and it was the encouragement that helped get them there. The stand had a good atmosphere, and one of the enjoyable aspects of the show was chatting with the other members of the team. We were made up of several groups all working in the area of inclusive cycling; the WiZZBiKE Foundation, Wheels for Wellbeing, Handcycling UK, Cycling Projects, CTC Cycle Champions and of course ICF. Caroline represented ICF on Sunday (billed in the background as ‘the equalizer’ in a shot taken in the days when she was a punter rather than a volunteer at the Sheffield project in Hillsborough Park), Mai-Ling came in on Friday along with a pannier full of this season’s sensational must-have fashion accessory – the ICF T-Shirt, and Brigitte helped out yours truly on Saturday and Sunday. Roger (WfW) and Barry (HCUK) had a wheel in both camps. The busiest day was Saturday but there was a steady stream of visitors to the stand throughout the show: some interested in trying cycling themselves – I got to demonstrate the swinging crank on my Brompton several times; some who were already riding and wanted to get more involved – I had an interesting conversation with tricyclist John Horan, recently interviewed on BBC Ouch; some interested on behalf of a friend or family member; some who wanted to volunteer at one of the inclusive cycling centres; and several from the trade who wanted to stock some of the specialist cycles. We were even visited by ICF member Tony Hull (above) who hand-cycled over to the show using his electric assist clip on unit from dutch company Roam Special Cycles. 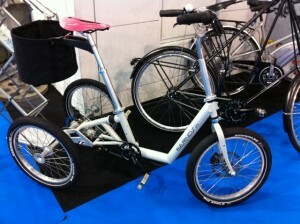 German manufacturer Bernds had this prototype trike with a Rohloff transmission on their stand. It has a low step through and a low bottom bracket, drive to both wheels with an adjustable clutch between the axles. It also has a hinge just behind the bottom bracket for folding and for suspension (see the black elastomer just behind the seat tube). The rear wheels and axle stubs are removable. Designer Thomas Bernds demonstrated how it worked and explained some of the improvements which will be incorporated into the production version. We also discussed the difficulties with getting trikes accepted on trains and the possibility of having a ‘part-fold’ that reduced the trike to get it within the envelope of the ‘standard’ wheelchair, but maintained the ability for a disabled user to wheel it along. The verdict? Extremely tiring but very satisfying and definitely worthwhile – next year we’re at the NEC, Birmingham. 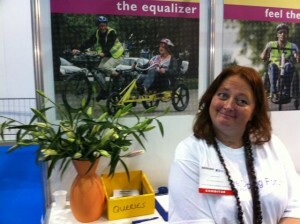 This entry was posted in Inclusive Cycling Forum and tagged bikes, disability, london, mobility, show, video, wfw, wheels4all, words on Wed 13 Oct 2010 by kevin hickman.